Sir Robert Francis QC, who led the inquiry, made a series of recommendations in his report including the appointment of “guardians” in each hospital to support staff who want to raise concerns. However, two former whistleblowers who spoke to RT, said the report fell short of tackling the real problems facing staff who speak out. 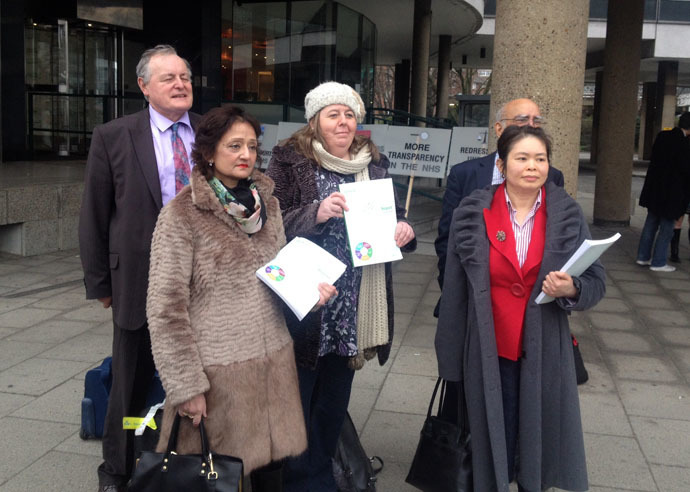 A group of former NHS staff protesting against the service’s “horrific” treatment of whistleblowers on Wednesday claimed the report did not go far enough to stop further incidents happening. Carrying placards calling for “more accountability” and “more transparency” in the NHS, the group marched from Millbank Tower to Downing Street. Minh Alexander, a former consultant psychiatrist and whistleblower who joined the protest, outlined areas where the report fell short. “Based on our collective experience, NHS organizations can be extremely devious and there is a lack of independence between NHS organizations and regulators, in our opinion,” she added. Dr David Drew, a respected pediatrician who was sacked for gross misconduct after raising serious concerns about patient protection, admitted the report had some good recommendations. He told RT: “This is a good report, [Francis] worked hard to understand the situation. He’s come to understand the horrific reaction that whistleblowers in the NHS can meet … and he’s recommended a few things which may help to calm that down in the future. “But the big problem is that he has done nothing to address the problems of those people who have been ruined as a result of whistleblowing in the past,” he said. Drew was fired after a 37-year career in the NHS for sending a well-known prayer to staff by email. He claims the real reason for his dismissal was because he questioned the competence of a fellow consultant who sent a toddler with “suspicious injuries” home in 2007, only for the child to be killed by his step-father a week later. An independent investigation into 16-month-old Kyle Keen’s death found it could have been prevented. Drew’s unjust dismissal is an example of the “shocking” treatment Sir Robert Francis heard about during his inquiry. Drew believes the report should recommend giving assistance to whistleblowers who risk everything to tell the truth. “There are 30- and 40-year-old people who lost their jobs, their careers, they’re ruined financially through the tribunals. Their health is gone, often, they have no future, and Sir Robert has not been able to make any recommendation to help those people. “I think that’s wrong and it’s something we will be continuing to campaign on,” he added. The Freedom to Speak Up Review does recommend the NHS help workers who, as a result of raising concerns, are unable to carry on in their current employment. As such, NHS whistleblowers like Dr Drew, who were sacked on trumped up charges of “gross misconduct,” may not be eligible for support. While conducting the inquiry, Francis heard evidence from 600 people. Another 19,000 filled out an online survey. Key recommendations made in his report include the appointment of “guardians” in hospitals to support staff who raise concerns. Francis calls for a national independent officer to help guardians when whistleblower cases are encountering problems. The report also called for new processes to be established at all NHS trusts to ensure staff and patient concerns are investigated properly. ‘He’s come to understand’? Only a complete dimwit could have failed to understand the malpractice that has, for years, been rife in the NHS.